Vivien Bowman Pet Portraits01291 629676work ShopVivien is a water colourist; she was born in Lancashire and her early influences in painting and drawing were the rocks of the Pennines. She moved to Chepstow in 2000 and now takes inspiration from animals of all shapes and sizes. 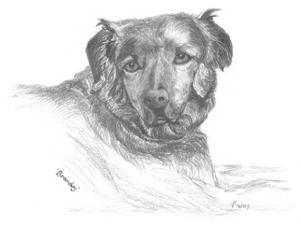 Commissions have included pets,horses, Raglan Castle, a herd of Herefordshire cattle and country homes. The ponies are an example of the use of pen and watercolour. They were worked from a photograph to show the delicacy of the geldings' colours and the relationship between the two animals.This commission was completed within a week and has been reproduced onto cards for the client. This lurcher, Lucy,was completed in pencil and ink which is a good combination of media to use when the subject has fine musculature and subtle-toned fur. All works can be delivered framed or simply mounted to the customer's specification.Prints or cards can be made of all works. Vivien's more recent artwork has expanded to include the historic buildings of Monmouthshire and the fungi and wildlife to be found in the woods of the lower reaches of the Wye Valley. Ruined buildings, rusty boats and agricultural machinery are all part of the artist's portfolio. I like the way that sky and land merge and I try to capture the linkage as with this painting of Offa's Dyke; snow both covers form and reveals ancient structures that we may not normally notice.The play of light on snow also affects the colours and shapes within a landscape. Vivien is a water colourist; she was born in Lancashire and her early influences in painting and drawing were the rocks of the Pennines. She moved to Chepstow in 2000 and now takes inspiration from animals of all shapes and sizes. Commissions have included pets,horses, Raglan Castle, a herd of Herefordshire cattle and country homes. e-mail or 'phone me at any time to discuss your commission!